In recent month’s we have seen the race for quantum supremacy heating up. Some of the world’s largest tech companies are going head to head in the battle to develop a quantum computer capable of executing a task that is just not possible with a conventional computer. The precise tipping point (in terms of qubits) is unknown, but for some time now it has been assumed that 50 Qubits might be the magic number. In November of 2017, IBM announced it was carrying out tests on a 50 Qubit device and in January of 2018, Intel announced it was testing a 49-qubit chip. Earlier this month (March 2018) Google announced it was working on a 72-qubit chip. This represents a significant advance on its previous 9 Qubit chip and puts it in pole position (for now) in the quantum race. 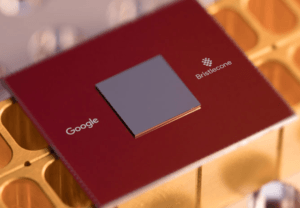 In its March 5 announcement, Google introduced Bristlecone (the name adopted because the configuration of Qubits resembles a pine cone) to the American Physical Society meeting in Los Angeles. They described the gate-based superconducting system as being able to “provide a testbed for research into system error rates and scalability” for Google’s qubit technology. The new chip retains the fundamental principles of its 9-qubit predecessor but was scaled to 72-qubits specifically with quantum supremacy in mind. The rate of change within the field of quantum computing has continued to accelerate over the last year or two. The challenge now, is that as we reach the point of quantum supremacy it is no longer possible to check the output of pseudo-systems of greater than 50-qubits using conventional super-computers. When it comes to producing a stable quantum environment, there are a lot of moving parts to contend with. This means a commercially viable device is still some way off, but the level of financial and intellectual investment in the field is likely to see experts revising down their estimates for a time to market. Theoretical physicists, mathematicians and research fellows are, no doubt, looking forward to the adrenaline rush of computing power that the quantum era will bring with it. IT security professionals, not so much. The potential for quantum computers is undeniably great, but so is the potential for harm. Quantum computers are ideally suited to performing the complex calculations required to crack today’s cryptographic protocols. As the critical lifespan of data gets longer, the danger presented by quantum computers becomes more tangible. Data stolen today does not have to be decrypted today to hold value. Financial, healthcare and intellectual property data stolen today could still be relevant in 10 years’ time and represents cash in the bank for a patient cyber-criminal. Much of today’s sensitive business and personal data relies on encryption to ensure both privacy and integrity. The coming of the new “quantum dawn” places the current cryptographic infrastructure at risk. Almost all of today’s commonly used algorithms will be rendered ineffective in the post-quantum era, which is why IT security and cryptography experts can’t simply bury their heads in the sand and ignore the quantum threat. In response, cyber security innovators are turning to quantum technologies themselves to counter the emerging threat. Advances in the development of quantum-safe algorithms, key generation and distribution are well underway; with real-world applications already in place.